Naan bread is, for me, one of the staples of a good Indian meal. Less rice, more bread; that’s my motto. And it’s a good one. One to live by. 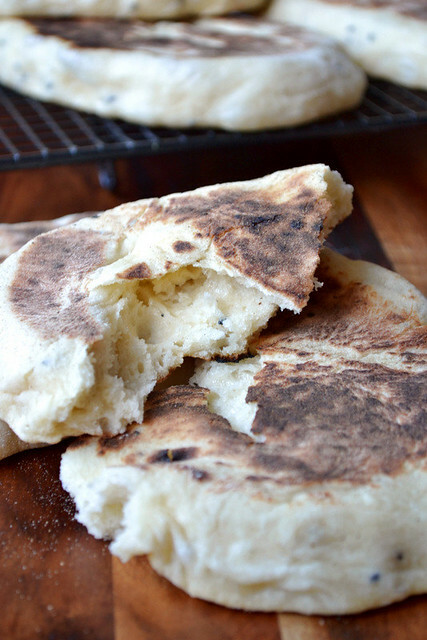 Homemade naan bread? Even better. Far better, in fact. 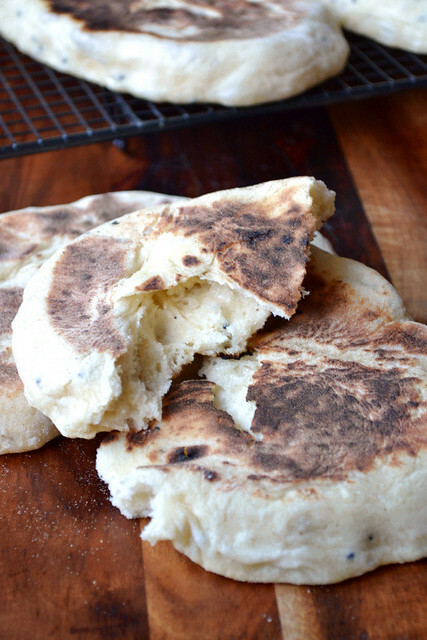 Once you’ve learnt to make a good naan bread from the comfort of your home, you’ll never look back. If possible, please do try and get your hands on some kalonji seeds, even if you only use them for making naan bread. They add an unforgettable fragrance that simply compels you to eat more. But kalonji seeds, often called nigella seeds or even black onion seeds, can be devilishly difficult to lay your hands on. If you’re feeling lucky, turn your attention to any Asian supermarket in sight. If you’re not, order them online. This dough is sticky and relatively difficult to work with. Don’t be scared. Get your hands messy. Resign yourself to a mucky surface. Embrace the perceived disaster. All will be well. You have my word. This isn’t a traditional white bread dough. And nor should it be. Your patience will be rewarded. Just trust the recipe; it’s good. And if you wanted a little something else to go with your curry, my recipes for onion bhajis, mango chutney and courgette and chickpea fritters are certainly worth giving a go. Combine the flours in a large mixing bowl. Add the yeast and salt on opposing sides and bring everything together. Mix together the water, milk, honey, olive oil and natural yoghurt in a measuring jug and pour into a well in the centre of the flour mixture. Add the kalonji seeds and bring it all together by hand, before tipping out onto a generously floured surface. Knead the dough for 10 minutes. Transfer the dough to a clean, lightly oiled mixing bowl and cover with a spotless tea towel. Stow somewhere warm and dry to rise for 1 hour. Once the dough has, roughly, doubled in size turn it out onto a floured surface and give it a quick knead. Divide into 6 equal portions. 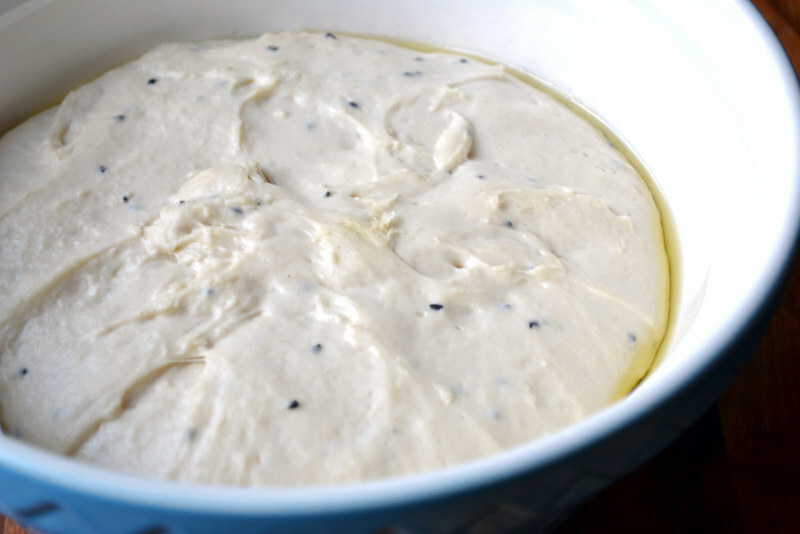 Press each ball of dough into a flat, naan-type shape. Take a heavy-based pan and dry fry the naan one at a time over a medium heat. Cook on each side, turning once the dough has visibly risen. 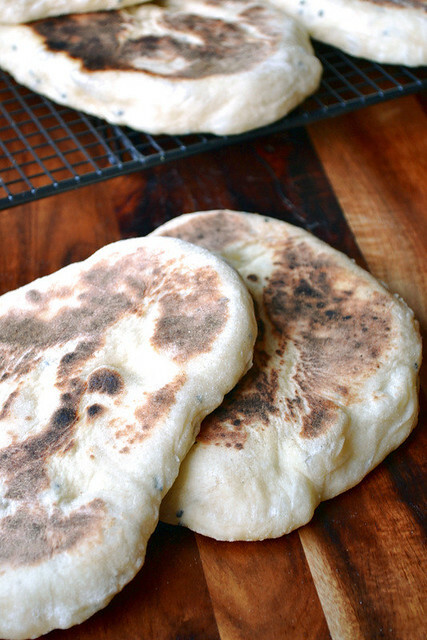 Each naan should be browned, or even slightly caught, on either side. Cost: Despite a few additions – namely honey, yoghurt and oil – your homemade naan bread won’t set you back very much at all. And certainly far less than any you’d find in a shop. 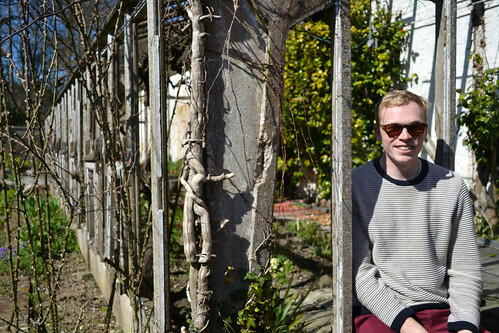 If you’re spending more than 75p you may be doing it wrong. Excellent recipe Nick. On the few occasions I have made Naan the dough has been a dreadful sticky mess. The bread is well worth the trouble, for sure. Yours appear to be very nice and well risen. I need to work harder! Thanks, Conor. It can be tricky to work with, but certainly it’s worth it. Happy new year! And to you too. I still haven’t had the bike out yet. Shame on me. Indeed! You must soon. I did my first imperial century of the year today. Hurting a bit. I was in the gym yesterday after two weeks in bed with a sinus infection and a week in the US for work. I’m hurting too. More exercise is the only remedy. I LOVE Naan bread. Great recipe thank you – when we have a houseful (almost all summer) I often pop past your blog to find a way to feed the little army without spending a fortune – I am thinking I may introduce indian nights – now I am off to check out your onion bhajis! I absolutely agree with you about black onion seeds. They are delicious. My current jar came from Sainsbury’s (own brand even!) and are called ‘nigella’ on the label. They’re not actually onion seeds, they come from a plant called Nigella sativa, hence the naming. They are a must. Ah fantastic – it would indeed! I will really have to try this recipe and factory-made naan has made its way to the BIG GROCERY in the small town where I am but it is at a ridiculously high price. And I make my way 45 miles north to shop for specialty items…the Indian store is a ‘must’ on a trip to the Big City. Please do – shop bought naan are no match for the real thing! “Less rice, more bread.” Nick, I couldn’t agree more! And your recipe looks marvelous. Looking forward to making it next time I make my Chicken Tikka Masala. My first Indian bread love is the chapatti but I adore naan and have made several different recipes. Most of them have called for grilling…will try the frying pan method next time! Nick, I’ve already commented here. But I wanted to come back and ask you if you’ve ever heard of the bread I just posted. I only just heard of it this week, but it’s been around since the 17th century. Isn’t bread just the best food group! 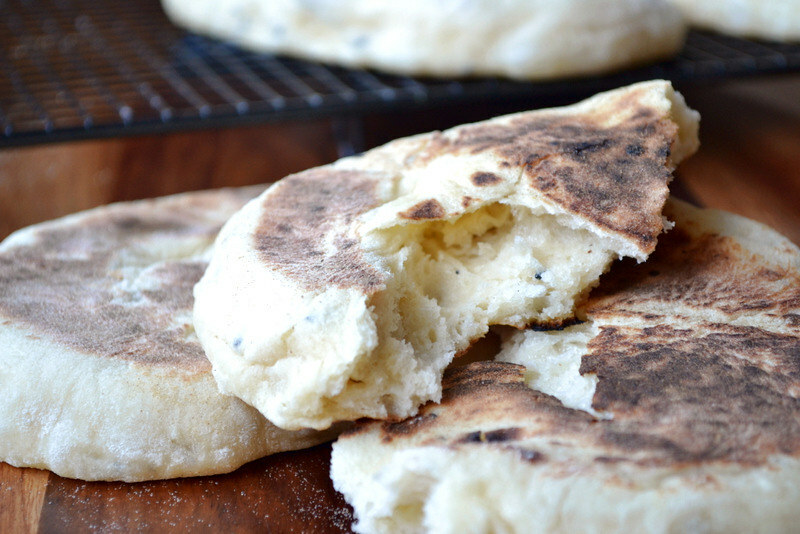 i usually make a much simpler version of naan, but this one looks worth the effort. I’m going to have to give it a shot! This turned out awesome. Great recipe. Thanks for sharing.